We arose quite early for our complimentary breakfast which consisted of bread, butter, cheese, jams etc. We were all reasonably satisfied, and we packed the cars not long after to travel on the next destination, Cappadocia. During the drive we stopped for lunch at a Turkish sandwich street restaurant. Next to that was a large supermarket chain which had women in clown suits dancing by the entrance. Their marketing techniques were clearly effective as we headed in to stock up on supplies. We noticed that beer in Turkish supermarkets was considerably more expensive than previous countries. We then travelled to Cappadocia Which had breath-taking scenery. Volcanic ash had compiled into soft rock and then eroded into stunning patterns. 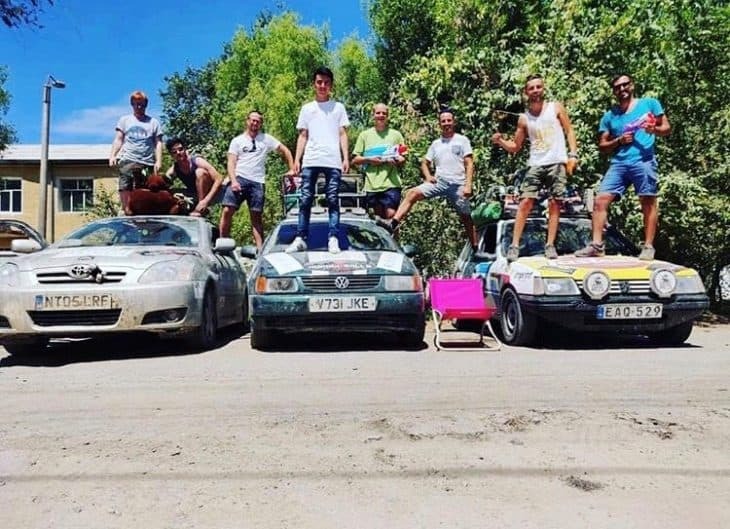 We arrived in Cappadocia and were met by previous travelling companions, team Mochram Men, for a reuniting of our original 3 team convoy. We all headed out to get some dinner and then spent the next few hours at a terrace bar nearby for some beers. The friendly owner served us until the early hours which we later discovered was against the law when an irate Turkish policeman spoiled the party. We took ourselves elsewhere and a few funny stories resulted from what was probably the most fun night of the trip so far. Rest assured, however, that all fun was in good taste. We got off to a late start this morning after all the beers the night before. We took a stroll to the underground caves museum down the road. We toured around in the sun for a few hours and saw ancient ruins and decorated churches from the 5th century. On the way back, we stopped off to quench our thirst. We saw a creamy looking drink being prepared called ‘Eyre’ in one of the stops along the road. We assumed it would be something along the lines of a milkshake and so ordered a few. We then discovered that it was in fact a yoghurt and salt-based drink. We all agreed that it was probably the most disgusting thing we had ever tasted. Once we got over that bad taste we decided to go for a Turkish massage. As we arrived we changed into towels and waited in a marble sauna surrounded by cold water taps. We were then called into the massage room one by one for the massage experience. It started with an exfoliation before being covered in bubbles and given a deep massage. Some parts were enjoyable, and some were quite painful. After the massage we had the best dinner of the trip so far. Not long after everyone had an early one as we were waking up at 3:30 the next morning for a hot air balloon ride.